Since the end of the 1990s, Roland Stratmann has been working with performance, installation and drawing. Often participative and playful, his work creates a dynamic of exchange for which it invents the forms of reception. Drawing, as place where the eye is trained and form takes shape, hold a central place. For his exhibition at the galerie laurent mueller, the creation of images happens through prior destruction, a cut which leads to new constellations of meaning. 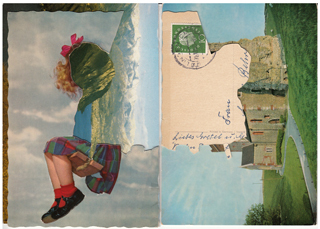 In his most recent series Post Cuts, Roland Stratmann uses postcards with pittoresque or folkloric iconography. Three cards assembled on their edge are the starting point of a game of cutting out, covering and inversion. The series titled Spots can be approached as a reflexion upon evil and ist banalisation by the media. In a famous text on the subject, Regarding the Pain of Others, Susan Sontag writes that seeing horrible images repeatedly makes them less real. Jacques Rancière adds: “If horror is banalized, it is not because we see too many images of it. […] But we do see too many nameless bodies, too many bodies incapable of returning the gaze that we direct at them […] 1. Roland Stratmann thwarts this distanciation from reality of the image by dissociation and layering. Drawings based on war and attacks images found on the Internet are inserted into fractured graphical compositions. These remind us of blood splatters. A dualism between the visible and the unrepresentable establishes itself, the image and its real violence withdrawn from view. Their stereoscopic composition implies the research of a viewpoint at the right distance of the subject, between the cliffs of blinding empathy and indifference. As counterpoint to this series of drawings, the installation Àpnoia punctuates the exhibition with its relentless noise provoked by pulsating air inside of bags like artificial lungs. Their character, at once ghostly and reminiscent of the body through its striking reality, relies on a dualism similar to the one in the drawings: a link is created between the precise observation of a disaster and ist imaginary reformation. The whole takes the shape of an investigation, it entices the visitor to ask himself what to think, and what to do with what he sees.